Inspired by Chinese cuisine? Your garden can be too! Many of the greens we associate with Asia are hardy and thrive in cool spring weather. These crops are very easy to grow, and early maturing. Try planting some in short rows, and then plant some more in two weeks. You’ll get a much longer harvest period this way, instead of having too much mature all at once. These little, spoon-like stir fry staples are often referred to as Bok Choy. Unlike many mescluns, these greens feature thicker stems and leaves, making them sturdier for stir fries. Our stir fried pac choi recipe was so easy and made for a flavourful side dish. The Ching Chiang is an earlier variety that tolerates heat, dampness, and cold. This should be at the top of your list for early spring planting! For urban gardeners, try the Toy Choi variety. It’s compact size allows it tolerate containers and raised beds. It’s so small relative to other varieties, it’s almost cute. Direct sow with frost protection (a cloche or heavy row cover) as early as February, or without protection from early March to late May. 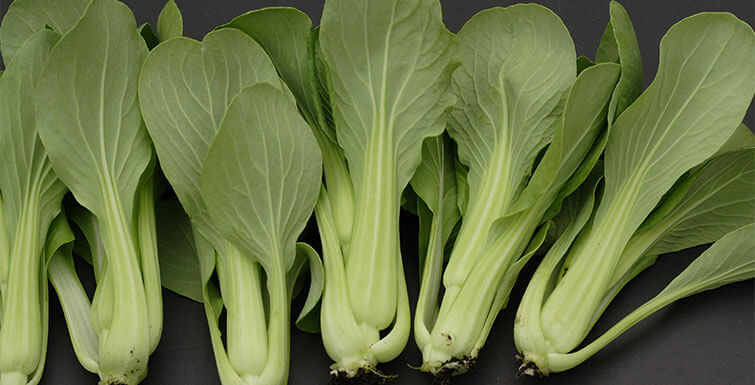 This plant is similar in flavour to pac choi, but it grows as a flat rosette, rather than an upright urn-shape. The spoon-shaped leaves of tah tsai are mild and succulent, adding a pleasing dimension to salad mixes, but also working in a stir-fry or soup. Only 40 days to maturity! This bitter brassica can take what you throw onto it in a stir-fry. Choi Sum is comfortable melding with garlic and chilies. The crisp flower stems and tender leaves of the plant are reminiscent of fresh asparagus. This pretty, feathery green is one of the earliest greens that you can grow. Mix Mizuna’s mildly peppery baby greens into salads or add the larger stems into stir-fries or as a side dish with roasted foods. You can direct sow this green as early as February if you protect it from frost, and repeat sowings until late May. Ruby Mizuna is also available, with dark red leaves that are full of antioxidants. Gai Lan is also known as Chinese Broccoli. It’s slightly more bitter tasting than Western broccoli, so it’s the perfect complement to balance strong sauces like oyster sauce. Plant it from early April to the end of May, and then again in the fall. This “napa” cabbage is perfect in salads. Unlike lettuce, it won’t falter when cooked so toss these sturdy leaves into a wok as one of the mainstays of your stir-fry. If you’re a fan of spicy kimchi, these lovely leaves are the foundation of this pickled cabbage delight. Cabbage is also a main ingredient in many pork dumpling recipes. Sui Choi is fantastic chopped and stir-fried with thick yakisoba noodles. Peas are an early spring crop, and the shoots emerge even before the peas are ready. Pinch off the curly ends and the first few leaves and toss these gently pea-flavoured delicacies into a stir-fry or a salad. We recommend Dwarf Grey Sugar. You can also grow peas as microgreens, and harvest them at just a couple of inches tall – they’re absolutely delicious! The selections above are the most familiar Asian greens to many North American palates, but a host of other leafy greens of Asian descent grow well here. Komatsuna and shungiku are all cold-hardy, fast-growing greens. Red leaf Amaranth prefers the heat of summer, and produces enormous quantities of nutritious, tasty greens. Garlic Chives are essential in Chinese dumpling making, and are very easy to grow, even in containers. Dive into the world of Asian greens and you’ll expand your spring growing options and your palate at the same time. If your garden has the space, why not try the Asian variations from the squash family, like Bitter Melon, Winter Melon, and Sponge Gourd? Asparagus beans (yard-long beans) also need space to grow up a sturdy trellis.